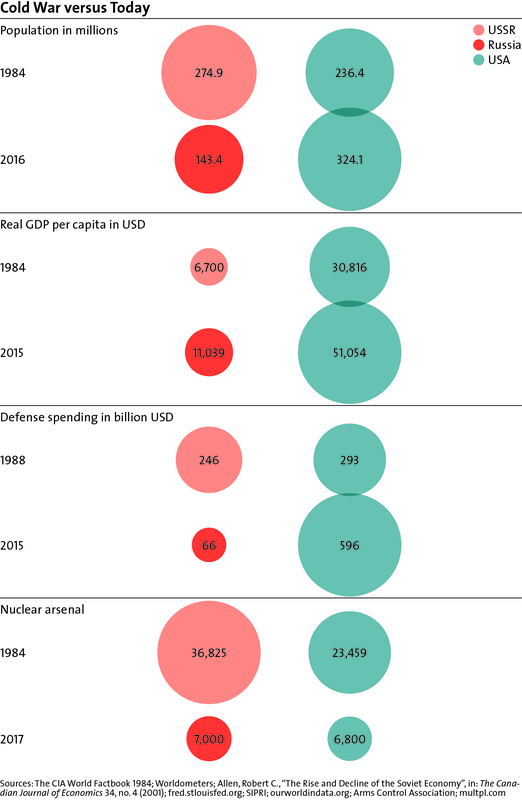 This graphic shows how the USSR compared to the US in terms of population, real GDP per capita (USD), defense spending (in billion USD) and nuclear weapons in the 1980s, as well as how the US compares to Russia in these key areas today. For an analysis of how different interpretations of the recent past still affect West-Russia relations and what is needed to rebuild trust, see Christian Nünlist’s chapter in Strategic Trends 2017 here. For more CSS charts and graphics, click here.